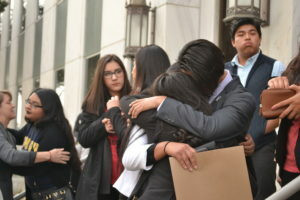 Georgia State and Freedom University students stood in the University of Georgia’s Board of Regents (BOR) meeting on Tuesday, Nov. 9, to protest the state’s undocumented student policies. Standing hand in hand around the table, the students were asked to step away but after refusing to do so, Georgia State Student Government Association (SGA) Senator Sara Moreno Duque was arrested. In a BOR statement, spokesperson Charles Sutlive said, “we respect our students’ rights to protest in an appropriate manner”. Laura Emiko Soltis, executive director of Freedom University said this wasn’t the first time undocumented students have protested against the policy in board hearings. “[The policies are] the business of all Georgians who care about this state and the dignity and human rights of undocumented youth,” she said. The BOR approved policies 4.1.6 and 4.3.4 in 2010, which disqualified all “non-citizen students” from paying in-state tuition, and disallowed any person “who is not lawfully present in the United States” from attending the state’s top universities. The board is currently facing three lawsuits from the Mexican American Legal Defense and Education Fund (MALDEF), Freedom University, and undocumented students concerning these policies. 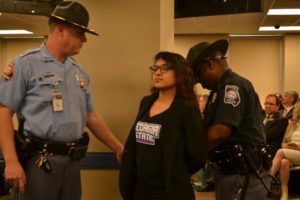 Georgia State student Asma Elhuni, said the policies go against the Deferred Action for Childhood Arrivals (DACA) federal policy, which makes the students legally present in the country. DACA was established in 2012 by the Obama administration and offers undocumented persons less than 16 years of age non-immigrant legal status. 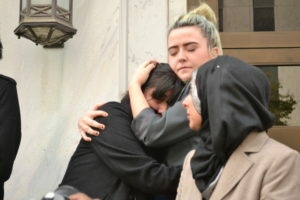 Before being asked to leave the hearing, the students were given the chance to say a prayer, which Angel Almora, Freedom University student, said will hopefully touch the hearts of the board and help take away their “cloud of hatred”. Georgia State student Oliver Flint said the matter impacts our university and all its students. SGA communications director Anthony Nguyen attended the hearing because he was curious to see how “receptive the Board of Regents are to issues of students”. “Today I saw students from universities across the System of Georgia stand together for an issue they believe needs action upon,” he said. “It is important to understand their cause and motivations behind their action. Nguyen said it’s not about disrupting meetings or protesting, but fighting for education and acceptance into today’s society. “Freedom University is fighting for freedom in our universities and to end 21st century segregation. I have friends who are DACA recipients (…) who’ve expressed their concerns to me, but I did not know the magnitude of those concerns until I came today,” he said.